I mentioned in the last post that analysis of the seismic waves produced during the August 6th coal mine collapse in Utah has led seismologists to conclude that the collapse was not caused by an earthquake, but instead that the seismic event felt and sensed by the seismographs was caused by the collapse of an underground cavity. I was reading this report from the Berkeley Seismological Laboratory and wanted to post this figure, which sums up one of the reasons they say this was not a natural earthquake. 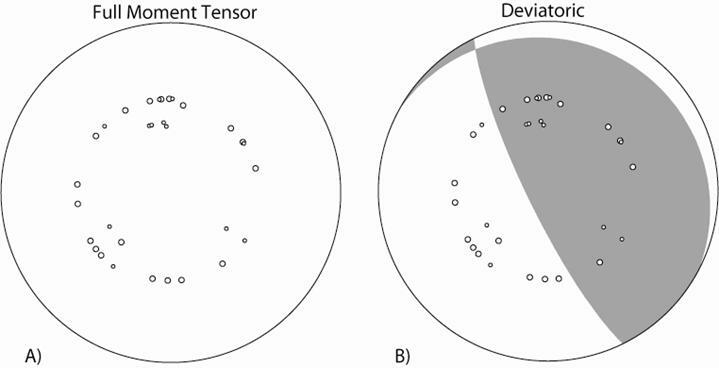 If you've read the primer on focal mechanisms, you will know that they are made by determining whether the first motion a seismograph senses from an earthquake is compressional (pressure), tensional, or neither. Many results are then plotted up, and based on the arrangement of compressional and tensional first motion waves, seismologists can determine how the fault moved. The diagram below shows the first steps of the beach ball diagram. All of the small open circles represent the results from individual seismic stations, the fact that all of the circles are open, and not filled, means that none of the stations recorded compressional first motions. This is not how natural earthquakes work, and is best consistent with the collapse of an underground cavity. The owner of the mine, Robert Murray, has insisted that the collapse was caused by an earthquake, although he has not provided any data to support his feeling, and all scientific reports coming in from seismologists have all pointed to a cave in. Understanding the types of events that cause seismic waves is not just used to understand faults and earthquakes, this is also one of the best ways to monitor underground nuclear bomb testing around the world. Just like a cave in, underground explosions have distinctive signatures that allow seismologists to differentiate them from natural earthquakes (or mine cave-ins). Nice. I may quote you in my blog since I've been meaning to talk about this event. Cheers. Excellent, my spanish is so terrible (although I can order beer and ask if hotels have any vacant rooms) I would welcome the souther american contact! I am working through some of your posts with the help of a spanish-english dictionary! Hehe. Well if you ever come to Peru I'll let you invite me a beer so you can practice your spanish :D Thanks for your interest. Thanks for posting that. I looked for a moment tensor on the USGS pages last week, but couldn't find one. 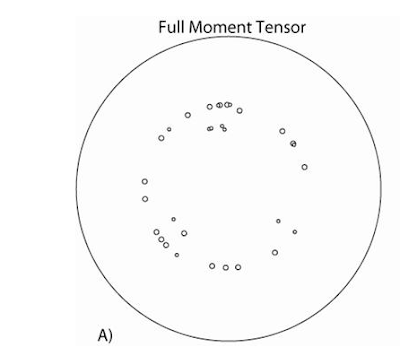 This is a great example to use in class when I talk about moment tensors - this is a very practical reason why they're useful (aside from all the fun armchair tectonics that can be done with them). Thanks, I was pretty interested in the report, especially after all of the claims from the mine owners. For teaching, it would be really interesting to see one from an underground explosion as well, any suggestions? We recorded a salt mine collapse on the SOSN, but I think you have to ask Bob Mereu to get it, since it has dropped off the web site.